None of my clematis earned Clematis of the Month for either January or February, and almost not for March either. 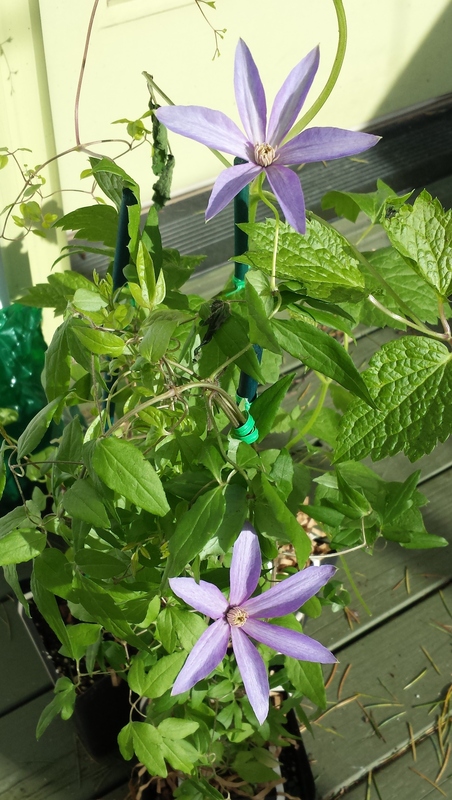 But one of the three clematis I ordered from Brushwood Nursery arrived in late March — IN BLOOM! And lovely blooms they are, too. 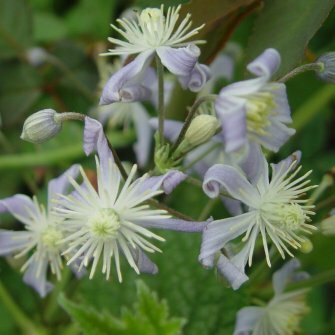 This lovely clematis is a new introduction from Ton Hannink of The Netherlands. He’s a clematis friend whom I know through the International Clematis Society. This clematis and it’s sister Clematis Sugar Sweet Lilac are both strongly fragrant. Even my little one with just two early blooms flaunted its perfume! Because the vines will grow only 6′ – 9′, mine will look great in a pot on the deck, where I can enjoy the wafting fragrance. Another plus — they are pruning group c, which means pruning is a cinch — just whack ’em back to 1′ – 3′ sometime between late fall and early spring (probably wait til early spring in colder climates). You can get one for yourself, just click here. I actually ordered three clematis from Brushwood this year. The other two are Clematis Etoile Rose and Clematis Mrs Robert Brydon. The three pots are sitting together in the photo above, so some of the leaves are belong to the other two clematis. C. Etoile Rose is a texensis hybrid. 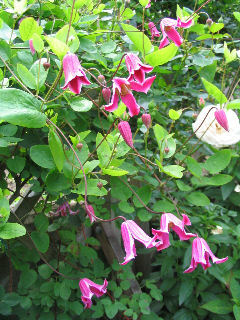 C. texensis is a species clematis that grows on riverbanks in Texas and has small red urn-shaped blooms. Click here for more information on C. texensis. Since the late 1800s hybridizers have been using this species to bring red into the clematis color palette. 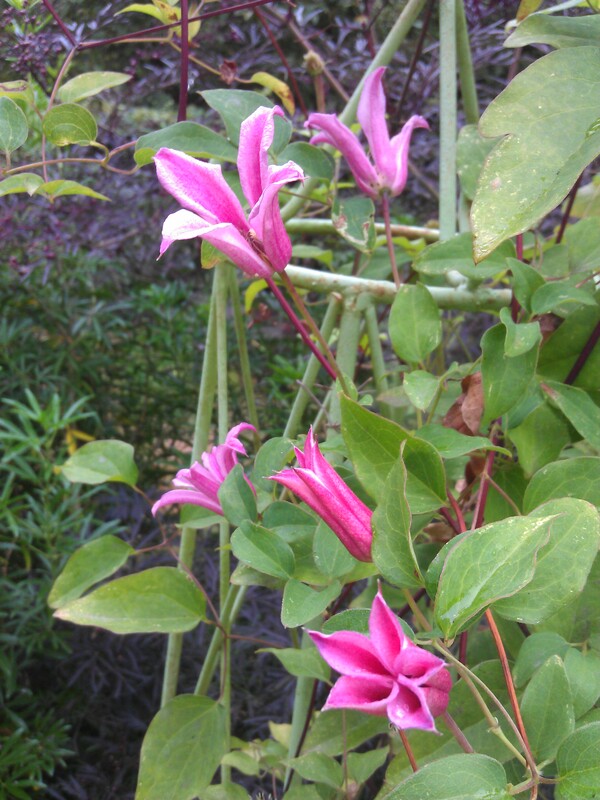 In fact, almost every red or dark pink summer-blooming clematis has C. texensis in its background. In addition to C. Etoile Rose, C. texensis hybrids include C. Duchess of Albany, C. Princess Diana, C. Ville de Leon, C. Sir Trevor Lawrence, and many others. I thought I already had C. Etoile Rose, but recently realized that what I really have is C. Duchess of Albany. Both have pink tulip-shaped blossoms, but those on C. Etoile Rose are downward-facing, while the flowers of C. Duchess of Albany are upward-facing. Mine were definitely upward-facing, so, of course, I had to purchase a C. Etoile Rose as soon as possible. I had heard of C. Mrs Robert Brydon but had never seen it in person until I saw it in a vase on the table at a garden luncheon. At first I thought the small flowers might be from some kind of Thalictrum, aka meadow rue, which is not surprising since Thalictrum and Clematis are kissing cousins. I finally realized that in spite of it’s small size it just had to be a clematis! I was right. This one is not a climber — it prefers instead to lounge about on whatever is convenient. Can’t wait to see it blooming in the garden — hmm, what shall I provide for it to lounge upon? Laura, thanks to your blog post I ordered Sugar Sweet Blue from Brushwood. It arrived today and is already in the ground (didn’t come with flowers, though, heh heh). They have great service, like you said. To make it a pair I also got AVANT-GARDE and was going to put it in a pretty shady spot but am having second thoughts. Do you have experience with AvG, will it still bloom with only a couple of hours of morning sun? Maybe it would be better to grow it into a rampant red twig varigated dogwood bush that is in a sunnier spot? Thank you for your comment! I hope you like C. Sugar Sweet Blue as much as I do. Regarding your question about C. Avante Gard — mine is planted in shade, though if it would just grow up, it would get great sun. Unfortunately, it isn’t doing as well as I would like. I think C. Avant Gard needs more sun. A very general rule of thumb is that clematis with strong flower colors like pure white, red, dark blue, or dark purple prefer full sun. More pastel shades, like cream, pink, light blue, or light purple, prefer some shade. Perhaps you should consider moving your C. Avante Gard to a sunnier place before it gets too settled. Keep me posted how your clematis get along. Laura, thanks for your response and great advice, I just now read it. My gmail is categorizing my emails now and I didn’t check my “social” tab. Fortunately I did have second thoughts about my original location for AVANT-GARDE. My daughter thought it was too gaudy for the front yard! So I put it in the back on a west facing wall. It will start to get strong summer sun from about noon to 6 or 7 PM so hopefully that will do it. I am also excited about “Sweet Summer Love” which should be coming from Proven Winners this week ($$). It will be in a similar growing position west of a fence. If it gets above 6 feet it should get plenty of sun. “Sugar Sweet Blue” has a part sun part shade position on the west side of a metal arbor my husband just welded for me, along with a macropetala “Markham’s Pink” I found at Swanson’s. They will get more shade later in the summer as my purple smoke tree and “Blue Angel” leaf out and shade the east side of the arbor. I liked your post about Otophora. Is it evergreen? It sounds cool, but I try to stick mostly with hard prune types (macropetala and montana exceptions). Also it’s very hard to find I guess, unless you can try it from seed. Aack, I am up to 33 now, most planted in the last 3-4 years. So far the only fatalities appear to be the Stolwick Gold Alpina (bugs or late freeze? not enough sun?) and Huldine (water neglect by family when I was suddenly called out of town late August for 2 months?). I will keep “watering the stick” as Debbie Fischer says. WOW! Thirty-three clematis means that you are approaching Clemaniac status. Way to go! Sugar Sweet Blue is looking terrible and limp. Is it possible the roots are getting drowned because of all this rain we are having? I started putting a cover over it (with ventilation) to see if this helps. Maybe the plant was too small to go in the ground right away? Let me know if you have any suggestions what I could do to save this little guy. I’m so sorry your Sugar Sweet Blue is not looking well. Could just be transplant shock or, as you suggest, too much rain (or too much sun) too soon. After all, the plant had spent its young life in the comfy conditions of a greenhouse. I often just set a garden chair over a new plant. This protects it from both rain and sun for a few days (or a week or two) while it settles in. You could even try draping clear plastic loosely over the chair to make it feel a little more like a greenhouse under there. Mine is still in its pot — hopefully, I’ll have time to plant it out this weekend. Keep us posted on how yours does. Thanks, Laura, I will keep the cover tilted over it for a while since more rain is on the way. I wonder if I compacted the soil to much? I usually stomp the soil down well with my feet when I plant my tomatoes, but perhaps clematis like to maintain a little more air around their roots? It is fairly sandy well-draining soil, I amended the hole with loose soil mixed with well-rotted wormy compost (made mostly of grass, ground maple leaves, coffee grounds and banana peels), a small handful each of bone meal and alfalfa pellets. I hope it survives. The others I planted this spring with the same amendment look fine so far (Viorna, Broughton Star, Markham’s Pink, Lambton Park, Etoile Violette, Jan Fopma, AVANT-GARDE and Sweet Summer Love). Sounds to me as though your clematis will be alright. When you say “stomp”, do you really mean stomp or do you just firm the soil around the plant with your foot? Wow, you planted some great clematis this spring! Way to go. I see you are coming to the West Seattle Nursery! I am sorry I can’t participate, I have a visitor from Italy in town to see the sights and I’m also running a Bike Rodeo at Alki Summer Streets that day. I am afraid Sugar Sweet Blue has met it’s maker (not Ton). I probably should have left it in its pot longer, it was pretty small. The others are doing well. Even Stolwijk Gold which has looked dead all Spring is suddenly showing signs of life. I’ll be speaking a t several other public venues over the next few months — you’ll find a listing in the column on the left. I’m so sorry your Sugar Sweet Blue succumbed. Maybe you can try again. Laura, o happy day, a resurrection occurred and I see a 1 inch sprout of Sugar Sweet Blue emerging from the ground! Oh, that’s great, Kathy! Truely, we should never give up on a clematis til a year or more has gone by. They are famous for reappearing after months of no sign at all. Laura – Have you ever grown any of the texensis group in Pots ? Yes, Patrick, I have. The rule of thumb for pots is that if the plant will have vines less than 6 or 8 feet long, it should do well in a pot. Most texensis hybrids fit the bill. They need large pots (at the very minimum 15″ wide and 18″ deep–2′ x 2′ is even better). Be sure to fill pot with rich, well-draining potting soil.